In 1975, a group of New Mexico State University students decided to pool their resources and start a buying club to purchase whole foods at bulk prices. Legend has it that the items they sought out bulk whole grains like brown rice and wheat berries, giant blocks of cheese, and Celestial Seasonings teas, which were not yet available in the area. What began with a few young people looking for ways to eat better with less impact grew, and a home on Foster Road in Las Cruces became the original Organ Mountain Food Cooperative. The store was open to public, not just co-op members, and that policy of inclusivity has remained throughout our history. The members who had originally volunteered their time purchasing products, coordinating, and distributing the bulk orders now tended the store in exchange for a discount. There were two groups of workers: “Core Workers” and monthly “Working Members”. Over the next fifteen years, the co-op moved locations twice, expanded once, and changed its name three times, before finally becoming the Mountain View Market Co+op that we all know. We continue to work toward our goals of being a beacon of sustainability, of empowering employment, of improving local economic stability, and promoting the cooperative business model. Thanks to your support, local farmers and producers have another market for their homegrown goods. Mountain View Market Co+op is pleased to carry over 400 local goods in our system with expansion monthly. By purchasing from local producers, we are able to help empower entrepreneurs and other small businesses. Local Products average 10% of our annual sales, compared with the national grocery store average of just 1.8%. In addition to supporting a stronger local food system, it’s easier to know where your food is coming from. By knowing who our producers are, we are able to be part of a more transparent food network. We know the producers that we work with. Buying local creates more jobs and you can actually see who benefits from your purchases. In 2016, we generated more than $300,000 in sales from products by local producers. We stock goods from more than 150 local farmers and producers. On average, money made on local sales generated by locally-owned businesses stay in the local economy two times longer than sales made at big box retailers and other corporate stores. This means that more money stays in the local economy and locally-made purchases are twice as effective at keeping the local economy alive. Co-ops give back. We are members of the community we serve. Our shoppers and owners are our friends, family, and neighbors. One of the best parts of being a cooperative business is that we can do things to benefit our community, to impact it positively. We’ve done a lot over the past forty years to nurture our local community. One of our favorites is our Three Dollar Dinner. The Three Dollar Dinner started in the summer of 2018 to provide a good, home-cooked meal to members of our community for just three bucks. Every meal includes a main and a side dish. Everyone is welcome to join us for good food and good company - it’s not just for co-op owners. Since our first meal, we’ve gone from serving about eighty meals to serving over three hundred on most weeks. All of our Three Dollar Dinners are made right here in the Co-op’s kitchen. Our dinners are available for dine-in and carry-out. In fact, many diners have one dinner here and get one to go for lunch or dinner the next day! We serve hearty American classics like loaded baked potatoes and sloppy joes, as well as regional fare like fajitas and posole. We try to have vegan and gluten-free options available for every meal. Our menu changes weekly, so you can plan ahead if you have food aversions, sensitivities or allergies to ensure that you’ll get a meal you’ll love. In addition to our Three Dollar Dinner, we also have the Round Up at the Registers program. Round Up at the Registers is a donation drive for local 501-C3 non-profit organizations. In the years since our first Round Up in 2017, our shoppers have donated over $7,000.00. 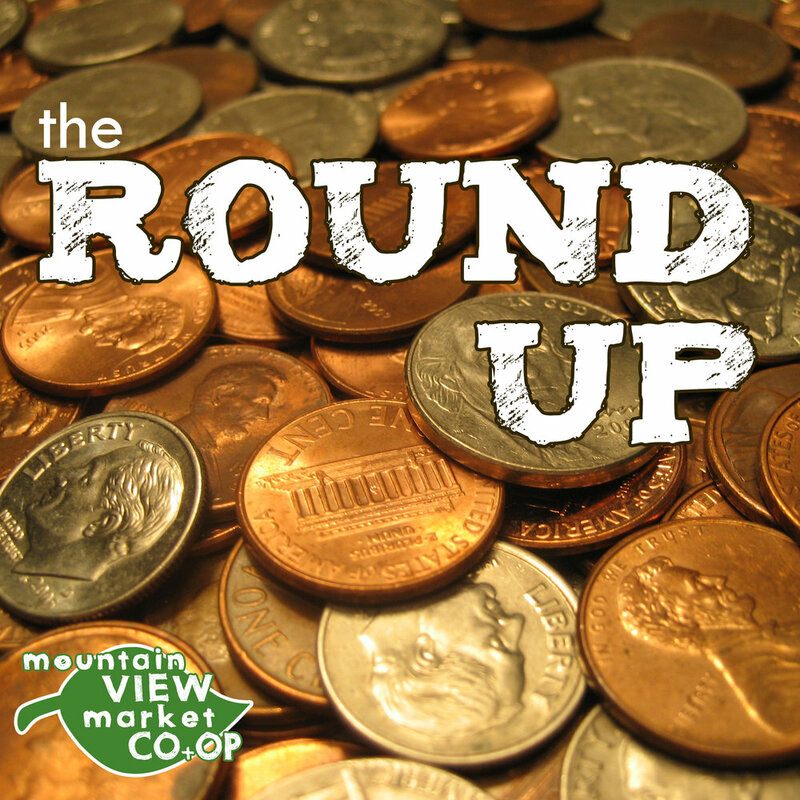 Round Up recipients are voted upon by our co-op owners during the annual owner meeting held each October. How does the Round Up work? During a selected month, our cashiers ask every shopper if they would like to round up their total to the nearest dollar. Shoppers may also donate any amount they would like. Every single penny of the donations collected go directly to the organization. If you are a member or director of a non-profit organization and would like to apply for a Round Up in the upcoming year, please fill out an application on our website and learn more here. A little spare change can make a positive change in our community. For food lovers on the hunt for fresh local produce and healthy, sustainable products, the local food co-op may be a hidden gem. Why hidden, you ask? Many people, including co-op shoppers, are not entirely sure how co-ops work—or how to get involved. Luckily, the most common misconceptions can be cleared up in a snap. Read on to get the real answers to frequently asked questions about food co-ops. You may be surprised by what you find! I have to be a member to shop at the food co-op. Everyone is welcome to shop at the nearly all co-ops. Just do your shopping like you would anywhere else. Once you’ve discovered the benefits of co-op shopping, you might want to find out more about the benefits of membership, too. I have to be a hippie/liberal/vegetarian/etc. to shop at the co-op. Same answer: everyone’s welcome. Liberal or conservative, hippie or yuppie, veggie lover or bacon lover—anyone can shop at a co-op (that means you!). Being a co-op member means I have to join the board (or work part-time at the co-op, or do something else I’m not really sure I want to do). I have to pay an annual fee to be a member of the co-op. To become a member of most co-ops, you invest a small amount of money in the form of shares. Most co-ops allow you to buy them all at once or over time (but most member benefits start at once). Your shares make you a co-owner of the co-op along with the other members. If for any reason you decide to leave the co-op, there is a process to get your investment refunded. There’s no reason to become a member if I can shop at the co-op for free. While co-ops welcome everyone to shop, there are definite benefits to becoming a member. For instance, members can vote in co-op issues, so they get a say in how the co-op works and where it spends its money. And speaking of money, when the co-op turns a profit, members may be eligible for a patronage refund in proportion to their purchases. There’s also a host of other member benefits that are specific to each co-op (just talk to the staff to find out more). So even if you only shop at the co-op once a month, the benefits are likely to exceed your investment, and you’ll get to play a part in a vibrant community resource.